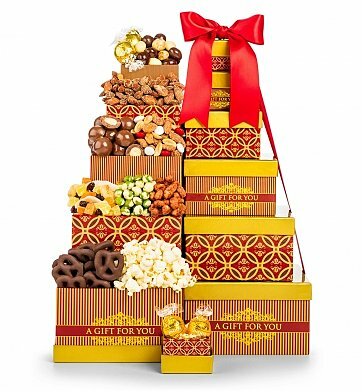 Premium chocolates and treats abound in this tower of six exclusively designed gift boxes. Decorated with a hand-tied satin ribbon, this eye catching tower doesn't need any gift wrap to make a long lasting impression. White and Milk Chocolate Caramel Truffles from Lindt. Savory Gourmet Popcorn, Milk Chocolate Malt Balls. Roasted Almonds, Chocolate Covered Pretzels, and more. Each item is carefully assembled by hand and accentuated with a hand-tied satin ribbon. A free card with your personal message or greeting is included, as well as complimentary scissors so your recipient can easily open their gift. Your gift will leave a lasting impression as they repurpose these six exclusively designed keepsake boxes, stacked together to make a tower. Classic Distinction Chocolate Tower is a hand delivered gift. These gifts are delivered by one of our local design centers located throughout the United States and Canada. Same day delivery is available for most gifts when ordered before the cutoff time. The cutoff time for Classic Distinction Chocolate Tower is in the recipient's time zone. My daughter doesn't like chocolate but all her friends do. So this box worked out perfect.. 6 non chocolate items and 7 chocolate items they even gave a couple as presents there was such an abundance of goodies! Great price too .. highly recommended. Purchased the Classic Distrintion Chocolate Tower to thank someone exceptional assistance. The tower was delivered as requested. Received a very thankful you email and a picture of the tower. The packing was beautiful and everyone loved it! I sent this to my dentist's office (oh, the irony), and they absolutely love it. Thanks so much! I bought this gift for Christmas for my Mom. She loved it! The chocolates and nuts were great. Great gift to send someone or for yourself. Look forward to many years of buying from Gift Tree!